No organisation is perfect. Whether we work, live or play in an organisation, faults and problems can easily hijack our attention. Yet organisations also have strengths, and in these strengths lies the potential for growth and change. What Works? brings alive the philosophies of Appreciative Inquiry and other strengths-based approaches by stimulating dynamic thinking and conversations about the stuff that really matters in any organisation. This savvy resource contains 28 digital cards—each featuring a key strength and four statements that can be used to identify, build and celebrate strengths in your team or organisation. Managers: use these cards to review the past year and identify future objectives. Team Leaders: use these cards to build a strengths-based culture with your colleagues. Business Owners: use these cards to explore ways to improve outcomes and employee job satisfaction. 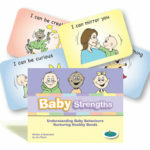 Each card also features a simple visual scale that can be used to add another dimension to any discussion. The cards can be highlighted or notes added and then you can take a screen shot. Participants can digitally write directly on the scale (screen or tablet) using the scribble tool. The scale can be used to rate an organisation’s performance in relation to the card’s prompt word. The rating can then be compared with the responses of others or used to assess progress over time. The digital version of What Works? 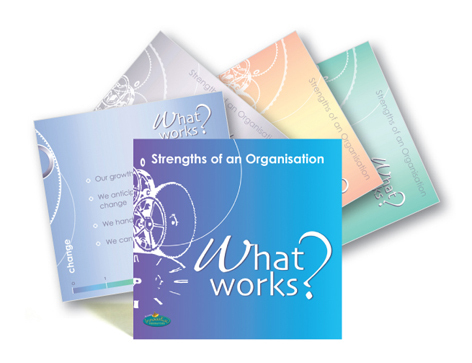 also comes with an online booklet full of ways to use this valuable organisational resource. If you have already downloaded MyConnect (Campion App) then you can purchase What Works? directly from Campion. Otherwise, please visit this page to learn more about how our eResources work. A wonderful resource for all Appreciative Inquiry practitioners, What Works? provides a strong foundation for generative conversations about organisational or community strengths. Distribute the full collection when planning with a Core Team, to expand thinking and Define the most appropriate/applicable topic of inquiry. As a precursor or follow-up activity to Appreciative Inquiry interviews, use the cards to encourage further Discovery about ‘the root cause of success’. During the Design phase, select cards relevant to identified themes and use the positive statements on each card as a starting point to develop Provocative Propositions. When reviewing the success of the Delivery/Destiny phase, selected cards may be used to trigger conversations about progress made and further possibilities. 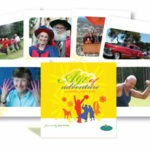 The accompanying booklet also includes a range of other creative ideas and tips for using the cards. An invaluable addition to the field of Appreciative Inquiry, What Works? can be used to inspire the rich, transformational conversations so essential for success.